iCloud Remover Org Review: Does It Really Work? It is a known fact that we depend on our smartphones for lots of things like accessing the internet, browsing, watching movies, etc. We can get so addicted to our smartphones that it becomes part of our life; thus, when we’re unable to get access to our iCloud account, we become frustrated because we can’t enjoy all the features. Some sites claim that iCloud Remove Org can solve your issue, but does it really work? Your question will be answered here. iCloud Remover Org is a site that provides iCloud account unlocking service. It promises to remove iCloud lock on any device worldwide. It claims that you can remove the iCloud account forever, disable “Find My iPhone” without password, or update the iOS version without being locked again to the iCloud. It requires you to download the guide from its website, submit your IMEI number, put your device into DFU mode and then follow the guide to complete the unlocking process. It’s not easy to figure out. Does iCloud Remover Org Real or Fake? According to our research and test, iCloud Remover Org does not provide what it promises. Many users have complained bitterly about this site not providing what they paid. They also complained of the company stealing their money and not replying afterwards. Reviews from Trustpilot shows that this company is not reliable and you shouldn’t use them either unless you have some money you wish to waste. Since iCloud Remover Org was proved to be fake, do not waste your time and money to try it. You’d better consider a reliable alternative which can really unlock your iOS device from iCloud account without password. You can consider iMyFone LockWiper. LockWiper is one of the best iCloud removers for any activated iOS device. We highly recommend this tool as the best choice for tackling iCloud account removal because it is reliable, works perfectly to remove all kinds of iPhone locks, passwords and passwords. iMyFone LockWiper is not free. But its free trial allows you to check whether your device is supported. Step 1. Download and install iMyFone LockWiper. Then launch the software, and select “Unlock Apple ID” mode on the software’s user interface. Note: If your device is not supported, you will be informed with the message “Your Device Is Not Supported”. Step 2. Connect your iPhone to the computer and trust your computer.Then click the “Start to Unlock” button. Step 3. LockWiper will begin the iCloud removal from your iPhone within a few seconds. Note: If “Find My iPhone” is enabled on your iPhone, you’ll have to go to Settings -> General -> Reset -> Reset All Settings. Your iPhone will restart and then the LockWiper will start removing the iCloud account to unlock it. This process won’t take much time. It only requires a few minutes. Once the process is complete, the previous iCloud account will be totally removed from your iPhone. You can now create a new Apple ID and enjoy the features that come with your device. 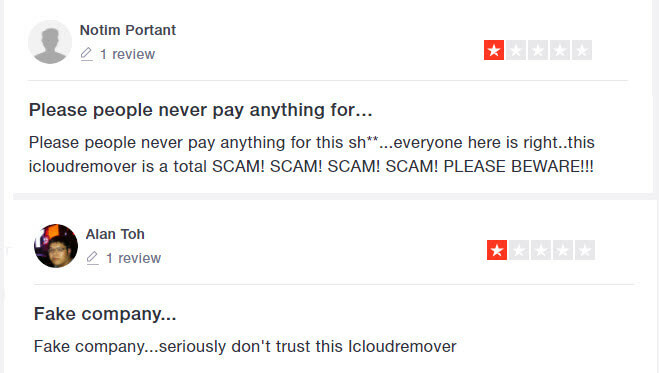 There are so many fake iCloud unlockers that are a total scam. They use every means to steal your money or make you download their software in order to monitor your activity. You have to stay away from them. Most of them are free and only require you to download their fake software which hopes to unlock your iCloud account. Here’s a brief list of these free iCloud Unlockers that you shouldn’t patronize. We’ve thoroughly talked about bypassing iCloud account without password and although there are scam sites, there are a few good ones you can trust and iMyFone LockWiper is one you should trust. If I Sign Out of iCloud on My iPhone Will I Lose Everything?